Favorite Credits: As an actor: The Power of Darkness at the Mint Theater Off B’way, and Romeo and Juliet at the Saratoga Shakespeare Company. As a director: A Midsummer Night’s (Queer) Dream at Theater for the New City, and The Hypochondriac at the cell. As a costume designer: The Myths at the Shakespeare Theater of New Jersey, and Assisting John David Ridge for the Broadway revival of Lily Tomlin’s Search for Intelligent Life in the Universe. As a costume artisan: making skin-tight pants for Lucy Liu in Charlie's Angels. Why theater? : I love the immediacy. It’s the aliveness of it. I tried my hand at film as an actor and designer, but it doesn’t hold a candle to the thrill of the stage. Anything can happen, and sometimes the greatest moments are created on stage through happy accidents. Great theater is a transcendent experience for me, both to watch and be a part of. It is as close to a spiritual experience I have ever known. 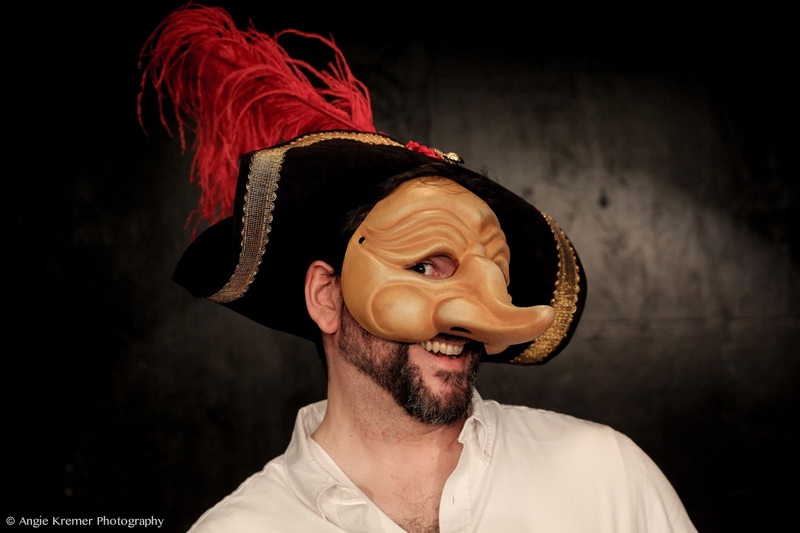 Tell us about A History Of Servitude: A History of Servitude is a wacky and wild Commedia dell’Arte performance that is part parody and part improv comedy. A History of Servitude is a comic survey of world history, from the dawn of man to the present. The play examines and celebrates the eternal struggle of the underdog. History remembers men (and to a much lesser extent women, which we point out as well) of greatness, who through conquest, innovation and accomplishment have left an indelible mark on the story of man. But what about the servants of these giants? Using the boldly physical slapstick comedy of Commedia dell’Arte, we bring attention to the contributions of the working class to history, which all too often goes unnoticed. The Great Pyramids of Egypt were built by slaves, but it’s the pharaohs whose names live on. A History of Servitude posits a comic reminder that ‘the little people’ are the ones on whose back much of history rests, despite the fact that the masters get all the credit. What inspired you to create A History Of Servitude? : Well, it was truly a team effort. The Department of Fools, our Commedia troupe, is comprised entirely of former students of mine from both NYU and the Lee Strasberg Theatre & Film Institute. Over many years of teaching, I have kept in touch with alumni who share my love of mask work and Commedia dell’Arte. Last year I invited about a dozen of them to join with me in creating a Commedia troupe that would present free theater throughout NYC, including subway busking and street performance. From the very start of Fools, the company was interested in examining the long history of the haves and have-nots through Commedia. At one of our first rehearsals, another of the Fools (Yair Ben-Dor – who has appeared on QUANTICO and elsewhere) suggested the title A History of Servitude and on the spot we began riffing on the theme; thinking about the master/servant dynamic from cavemen to modern humans. From that point to now, we have been developing the show largely through improvisation and devising techniques. There is no single writer or director. We do all the work as a collective, which offers unique challenges but the result is so much richer and more fun! What kind of theater speaks to you? What or who inspires you as an artist? : I love almost all kinds of theater, from musicals to the classics to sketch comedy, but sadly a lot of theater today is truly deadly (to borrow from Peter Brook). I want theater that grabs me by the soul and doesn’t let go until the curtain call. I think of plays like Mary Zimmerman’s Metamorphoses at Circle in the Square back in 2002, or Bedlam’s Saint Joan a couple years ago, and that is theater at its best. Raw, unconventional and deeply imaginative. I am inspired by theater artists (both past and present) who immerse themselves in the artistry of creation from multiple angles, like Julie Taymor and Moliere. I aspire to be like these artists in approaching the creation of theater not strictly as a writer, or director, or designer, or actor, but being all of them simultaneously. If you could work with anyone you’ve yet to work with, who would it be? : Gods, that is a long list! A few highlights: I’d love to work with Bill Irwin (the man is a comic genius and unparalleled clown), Mel Brooks (his work has influenced my approach to comedy more than any other individual), and Mary Zimmerman (her plays are simply divine). Please, any of you, feel free to call me any time! I’ll be waiting by my iPhone. What show have you recommended to your friends? : I don’t get to see as much theater as I once did, since the birth of my son. However, I tell people all the time to see anything Bedlam is doing, which currently is their adaptation of Pride & Prejudice. You can’t go wrong with Bedlam! Who would play you in a movie about yourself and what would it be called? : Kevin Spacey in "STAGES OF LUNACY: A STORY OF ONE MAN’S OBESSION WITH THE THEATER". If you could go back in time and see any play or musical you missed, what would it be? : It would be either Moliere’s Imaginary Invalid in the final performance after which he passed away, or Shakespeare’s A Midsummer Night’s Dream at the Globe. What’s your biggest guilty pleasure? : A tub of Ben & Jerry’s Chubby Hubby and binge watching on Netflix. What’s up next? : Right now, I am just focusing on getting through the end of August and the Fringe. After that, the Fools and I will get back to work on another show called The Tooth-Puller. It’s great classic comedy, but one of the integral Fools in that show is off finishing up the national tour of Newsies so we are waiting until he is back in the fall to complete work on that little gem.